I am finally far enough along on the metal work, that I've starting to do some test fitting! 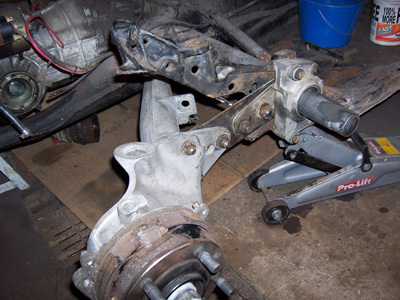 This is one of the rear trailing arms bolted up with the adjustable spring plate, and aluminum cover. Everything fit, except the two adjuster bolts on the spring plate. To get the clearance I needed, I shaved the forward most bolt, and welded it right to the spring plate. The adjuster bolt I cleared out the metal area behind to give plenty of area for a wrench to adjust. 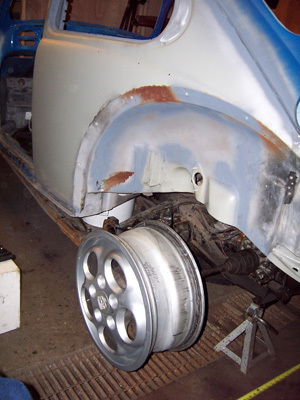 Here is the other side with the wheel mounted up. I wanted to see how much wider the new setup would be. Here is the extra width that I will have to deal with. To make this car look right, I think I will have to get some extra wide fenders. 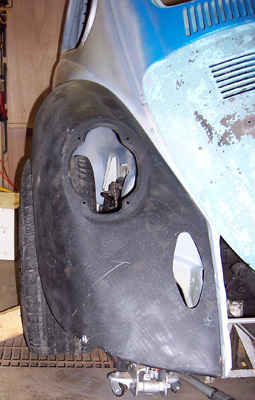 I know Creative Car Craft makes very good quality fenders.